This book took me by surprise. I have long been a fan of C.S. Lewis and have read several times his classic Screwtape Letters. But I had no intention of writing such a book myself. Then, over a period of a month in my own Bible study I kept reading the words of God and asking myself, what do demons want us to believe instead of this? By creating this contrast of truth and deception, I was amazed at how much clarity it brought to what God was actually saying. The next thing I knew I was writing out letters from one demon to another, in Screwtape style, and the book started to form. Originally I thought it would it would be letters only, like Screwtape, but the more I considered it, the more powerful I thought it would be if the book had a full-fledged story line, with characters, setting and a sense of immediacy that would hook the reader and get him more in touch with the reality of spiritual warfare. My goal was to plant a bugging device in Hell’s war room, to eavesdrop on the tactical discussions of demons strategizing how to deceive and destroy us. It was a remarkable process. Spiritual warfare is more real to me than it’s ever been, and I think I’m more alert to the Enemy’s landmines – it’s been encouraging to hear readers say the same. 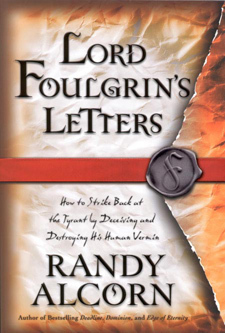 Lord Foulgrin’s Letters is designed to help you, the reader, know God, know yourself, and know your enemy. I hope you enjoy it, and that it makes a difference in your life. (If you want to hear the inside scoop on the book, and the reasons behind it, read the Afterword, which I originally designed as an Introduction, but moved to the back because I thought most readers might want to plunge directly into the story.) If you read Lord Foulgrin’s Letters please email me at info@epm.org and let me know what you think. Thanks! The less clearly they think about heaven, the better. Lord Foulgrin’s Letters weren’t meant to fall into our hands. But thanks to Randy Alcorn’s imagination, we have the opportunity to read the correspondence between Lord Foulgrin and Squaltaint, two of Satan’s demons. The object of these letters is a man named Jordan Fletcher. It’s Squaltaint’s duty to keep Fletcher out of the kingdom of God. This book may sound similar to C. S. Lewis’ classic, Screwtape Letters, but there are significant differences. Alcorn creates an earthly setting in which we view the lives of the Fletcher family. Each earthly vignette is followed by one of Foulgrin’s letters in which he analyzes and strategizes with his underling, Squaltaint. WEEK ONE: Chapter 1: It Doesn’t Get Any Better? 1. Who are the following: Jordan Fletcher? Diane? Jillian? Daniel? 2. What are your first impressions of Fletcher’s marriage? 3. What are your first impressions of the family relationship? Your book, Lord Foulgrin’s Letters, was refreshing. I wanted to thank you for writing a book that revisits some of C. S. Lewis’s ideas. If Jordan Fletcher wasn’t happy, it was only because he needed something else-someone else or someplace else. Originally I intended the following to be the Introduction to Lord Foulgrin's Letters. Later I decided to shift it to the back of the book, realizing some readers would want to dive straight into the story without explanation.